A few months ago, I wrote a post responding to a video which I failed to embed properly. Apologies. I suppose it was inevitable that Zero to Hero would challenge me to figure out that mess. I went back and fixed the problem–I think. For my month of blog fine-tuning–c.f., Zero to Hero–I’m supposed to write something which includes embedded media. In honor of this occasion, I have decided to share something that has snagged in the corner of my brain. It is not the usual Bad Parenting fare. I’m being haunted by a music video. I find the song mesmerizing. The lyrics are just inscrutable enough to tantalize my imagination. The melody is intoxicating, and the mix is perfect–complicated, well-balanced. What is bugging me is the video itself. I’m still trying to figure out what they were thinking. The set and arrangement of characters were modeled after what is perhaps Raphael’s best-known painting, a fresco he did at the Vatican called The School of Athens. School of Athens, from wikipedia. 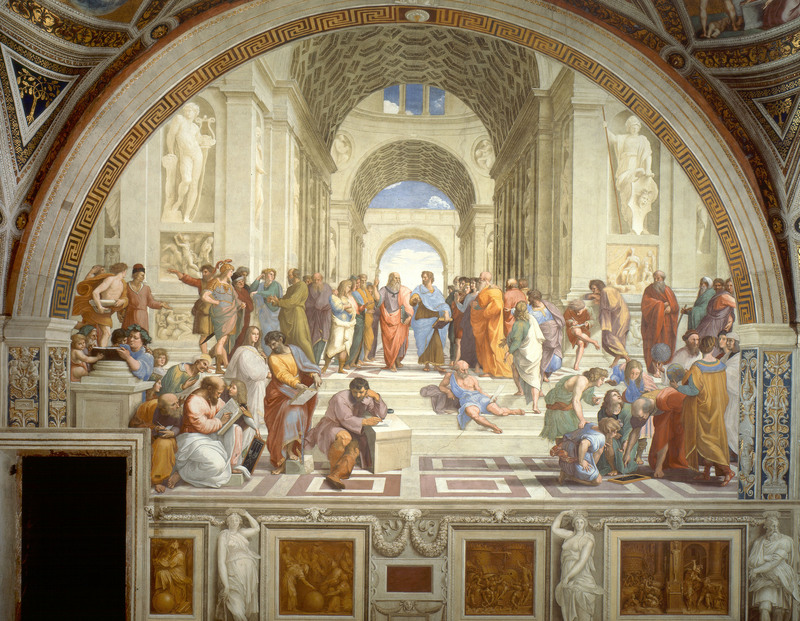 This painting supposedly includes “every great Greek philosopher,” which means everyone from Socrates and Plato to Euclid and Pythagoras. I don’t know any contemporary Greek philosophers, but it doesn’t matter: the painting was done in the 16th century, so I’m off the hook. School of Athens was part of a series that was supposed to illustrate a progression from reason (Western philosophy) to revelation (Christianity), and to show how they worked together–an idea that has been lost in these days of intelligent design vs. evolution. But what characters has alt-J put in their video? These are not meant to be philosophers. And why did alt-J choose to put this particular cast in dialogue with art history and religion? After a very un-scientific search, the best I could find was an off-hand comment about wanting to set contemporary figures from a “lower socio-economic status” into Raphael’s famous work. Fine. But these are not “poor people,” per se; these are stereotypes from gangster culture: the liquor in a paper bag, throwing dice, ferocious dogs, big earrings, wife beater t-shirts, heavy chains, spandex dresses. I look at pictures of members of the band and wonder: what are these pasty white guys trying to say? Are they trying to offer commentary on class and culture? Or simply show off their liberal arts degrees from Leeds? The video makes no sense to me, and borders on offensive. If this is what they think poverty looks like, I find it terribly condescending. Kind of like when Miley pops in a grill and acts out her impression of African Americans. Awkward, at best, but likely much, much worse. At the same time, I can’t stop listening to the song or watching the video in question, so who am I to judge? p.s. I did find out where they got the band name. Press alt-J on your keyboard and you’ll get ∆: the triangle that appears in their video and as their logo. Triangles are their favorite shape.